The ideal condo rental has all of the comforts of home at a price you can afford and A Place at the Beach VI offers your family just that. This captivating North Myrtle Beach resort is a wonderful value and gives guests modern accommodations at reasonable rates. You and your family can stay at this moderately priced North Myrtle Beach resort without sacrificing the creature comforts that you are looking for in a beach rental. The condo rentals at A Place at the Beach VI have many conveniences that are important to you and will make your life easy. With exceptional amenities and a fabulous location on the pristine beach, A Place at the Beach VI is an unbeatable value in North Myrtle Beach, South Carolina. This quiet and comfortable North Myrtle Beach resort is a great place for your family to vacation. Some of the condo rentals offer guests the chance to book longer rentals in the winter of up to a month. You can walk along the beach outside of your fashionable vacation rental and feel the brisk, salty air caress your skin during the cool winter months in North Myrtle Beach, South Carolina. The pleasant and cooler winter temperatures and natural beauty of the area make A Place at the Beach VI a popular winter destination and a wonderful choice for your well-deserved North Myrtle Beach vacation. Lovely winter weather provides you the opportunity to visit this family-friendly area anytime of the year making it easy to plan your next thrilling vacation in North Myrtle Beach, South Carolina. You can truly relax when you choose a well-maintained condo rental at A Place at the Beach VI in North Myrtle Beach, South Carolina. You and your family can wake up early and watch the sunrise over the sparkling water of the Atlantic Ocean from the balcony of one at the oceanfront condos at this charming resort. Relax and appreciate quiet mornings on the beach when you can take a few moments to yourself and reflect outside of this popular resort. The gorgeous views of the Atlantic Ocean from some of the condo rentals will entrance you and are an added bonus when you book an oceanfront condo rental at A Place at the Beach VI in lovely North Myrtle Beach, South Carolina. Each of the condo rentals at this North Myrtle Beach resort will have exceptional features and benefits. With conveniences such as a dishwasher, range, refrigerator and microwave, many of the condo rentals at this contemporary resort are equipped with everything you need to prepare meals for your hungry family after a long day of fun in the sun. Ample cabinet space in each vacation rental is essential for storing extra groceries and bottled water that you will need during your vacation. There are numerous other pleasing features you can find in the condo rentals at A Place at the Beach VI. In some condo rental at this North Myrtle Beach resort, there are ceiling fans that will help keep you cool while providing you with extra light in various rooms. Television sets are a necessity when you are looking for weather updates to plan a day full of exploration in North Myrtle Beach, South Carolina. You can watch the evening news or let the kids watch a show while you prepare dinner in your condo at your favorite North Myrtle Beach resort. Condo rental that have a DVD player give you additional functionality and a great way to host a family movie night. A giant bowl of popcorn, many blankets and an animated classic are a great way to spend the evening in your spacious North Myrtle Beach vacation rental. 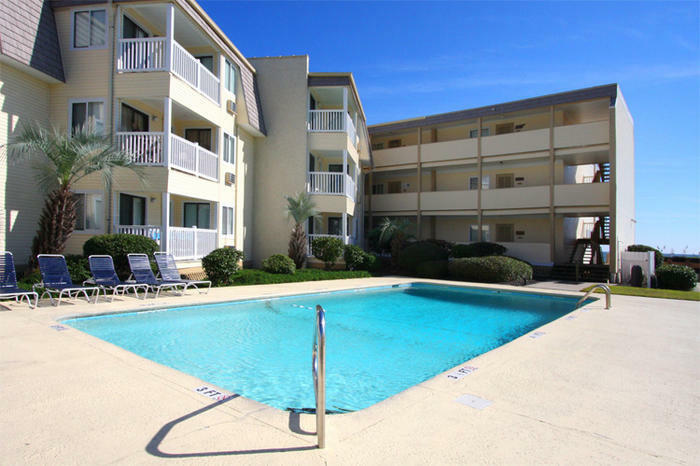 This North Myrtle Beach resort has condo rentals that have two bedrooms and two bathrooms. In a two-bedroom vacation rental, you will have the space you need to host your family. When you have plenty of space in your North Myrtle Beach condo rental, you can steal a few minutes of privacy when you like to make plans for the next day or just get some rest after a long day in the warm South Carolina sunshine. Each of the bedrooms in your well-appointed North Myrtle Beach condo rental will have sizable windows that let in plenty of light and help add to the cheerful ambiance of the bedroom. Some master bedrooms have gorgeous views of the beach and the magnificent Atlantic Ocean. With incredible views of the water, you can gaze out of the master-bedroom windows and admire the beauty of nature that is right outside your appealing North Myrtle Beach condo rental. Drift off to sleep to the sound of powerful waves crashing along the beach and let the music of the ocean guide you to restful and rejuvenating sleep when you and your family vacation in a condo at this pleasing resort in North Myrtle Beach, South Carolina.